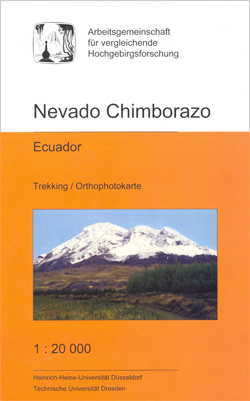 Chimborazo at 1:20,000 on a detailed contoured map showing climbing routes and mountain refuges, produced under the auspices of Consortium for the Comparative High-Mountain Research by the Heinrich Heine University in Düsseldorf and the Technical University of Dresden. The map uses as its base a digital orthophoto of the area overprinted with contours at 25 metres intervals and enhanced by colouring and shading to indicate glaciers, etc. Local roads and tracks are clearly shown, with an overprint highlighting and naming various climbing routes to the summit and showing locations of refuges. The map has both UTM margin ticks and crosshairs, and latitude and longitude margin ticks at 1’ intervals. Map legend and explanatory text include English.